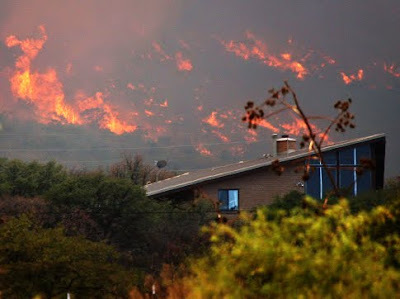 The Arizona Daily Star reports that residents of Tucson have come together to help victims of the Monument Fire by collecting food, clothes and money, and volunteering their time at evacuation centers. Staff and volunteers from the Girl Scouts in Tucson have been going to the shelters in Sierra Vista to deliver donations and organize games for the children there. Since last week, the Girl Scouts' offices have become drop-off centers for donations. Volunteers have made several drives to deliver food and drinks, but there is still a need for basic hygiene items. Girl Scouts are also set up outside many Walgreens stores in Tucson, collecting items and monetary donations in the next few days. Those wanting to help can make a monetary donation to the Red Cross fund for the Cochise County wildfire victims at the American Red Cross Southern Arizona Chapter or call 1-800-341-6943. For the latest information on donation and volunteer needs go to www.sierravistaaz.gov. On 14 June 2011, the Wallow fire was "upgraded" to the largest fire in Arizona history, passing the Rodeo-Chediski Fire which burned 732 square miles in 2002. Nearly 6,000 people have been evacuated. In addition to other air assets, a converted DC-10 Very Large Air Tanker, capable of dropping up to 12,000 gallons of fire retardant in seconds, was deployed to help fight the fire.